School has begun and I am working on stocking my freezer and cabinets with some healthy snack options for before, during and after Riley's busy full day in first grade! 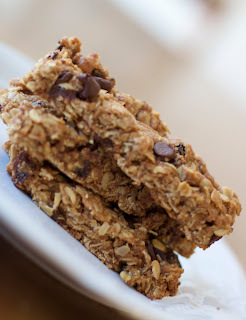 Of course it's easy enough to find granola bars in a box at the super market but I love being able to control the quality of ingredients that goes into their little bodies! I let the girls stay up about 15 minutes past their bedtime on Monday so they could help mix up a batch of these yummy granola bars. Everything is mixed up in one bowl making clean up quick and easy. My girls like raisins and chocolate chips in theirs but you can add whatever dried fruit your family likes best! In a large bowl, mix together the oats, brown sugar, wheat germ, cinnamon, flour, raisins, chocolate chips and salt. Make a well in the center, and pour in the honey, egg, oil and vanilla. Mix well using your hands. Pat the mixture evenly into the prepared pan. Bake for 25-30 minutes in the preheated oven, until the bars begin to turn golden at the edges. Cool for 5 minutes, then cut into bars while still warm. Do not allow the bars to cool completely before cutting, or they will be too hard to cut. Copyright © PrepAhead and Dine In: lunch box granola bars. All Rights Reserved.